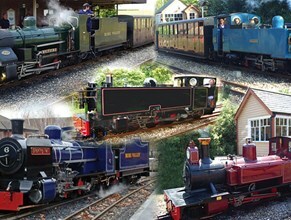 The Bure Valley Railway has a fleet of 26 coaches, which were all purpose built for the railway. All the coaches are fully enclosed with upholstered seating. The coaches are fitted with electric lighting and heating is provided in the winter months. The railway has 19 twin bogie carriages which have five bays each seating four passengers. Coach 20 is a standard coach but has been fitted with a guard's compartment. It has two open compartments with seating for four passengers and a parcels compartment. Coach 23 is an Electric Train Heating Carriage fitted with a 35 KVA diesel generator with a guards and parcels compartment. This is used for winter services to provide electricity for train heating. We have a fleet of 6 wheelchair accessible coaches, which were purpose designed and built for the railway to allow wheelchair and able bodied passengers to enjoy the journey together.